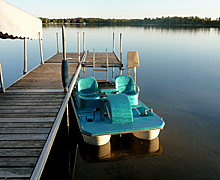 Peak Season (Memorial Day–Labor Day): $650.00 per night which includes a pontoon and paddleboat. 3 night minimum stay during Peak Season. No pets or smoking are allowed. 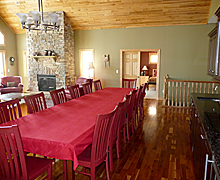 Off Season (Labor Day–Memorial Day): $450.00 per night. 2 night minimum stay in Off Season. No pets or smoking are allowed. When you book 7 or more consecutive nights, you save $50 each night – regardless of the season! Chateau Lake Louise is a 4,200 sq. ft. recently constructed walkout home, which has massive windows and patio doors facing the lake that welcome the outside in. 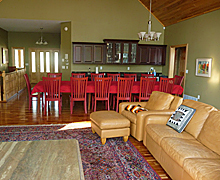 The 5 bedroom, 4 bath home sleeps 13 (3 king beds, 1 queen bed, 2 twin beds, a queen sleeper sofa and a crib.) 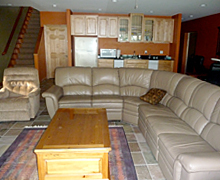 It also offers a walkout family room featuring a mini kitchen, ping pong table, foosball table and big screen TV. 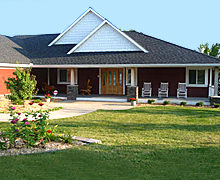 With a gourmet kitchen, 3 season porch and 2 laundry rooms, everyone can make themselves at home. Chateau Lake Louise is not directly a handicap accessible property, however from the driveway, it is only one step up to the entry porch. This single step allows access to the open and flowing main floor with its decks and living areas. The main level boasts a professional gourmet kitchen, an open living/dining room, master bedroom suite, a second main-floor bedroom and bathroom, as well as an up-to-date laundry room. The kitchen is spacious and open with a granite-topped center island featuring a vegetable sink with disposal, an ample amount of counter space including seating for two. The room is finished with lovely cherry cabinets, plentiful granite counters and all your favorite appliances. A toaster, mixer, blender, coffeemaker and spice rack are also provided. 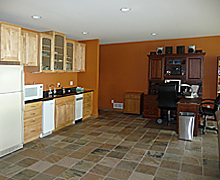 A second refrigerator is available on the walkout level and a beverage refrigerator is located in the dining area. 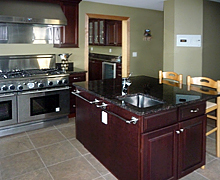 The kitchen centerpiece is a 48” Thermador professional gas range with two electric ovens. A dishwasher, compactor, microwave, disposal, and refrigerator with ice maker complete the kitchen appliances. This gourmet kitchen is stocked with pots and pans, utensils, platters, dishes, silverware, glassware and more for large and small gatherings. The porcelain-tiled kitchen floors flow into the huge open living/dining room which holds an 18’ long buffet and bar with granite countertops, bar sink and under-counter wine/beverage cooler. For large gatherings, the warm cherry dining table seats a group of 16 with ease. The cherry wood flooring, maple millwork, wood ash cathedral ceiling and natural stone gas fireplace provide a warm and natural environment that fill the interior. 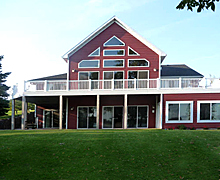 Four large patio doors provide magnificent views of the lake and access to the large, exterior wrap-around balconies. Double maple doors lead into the carpeted master bedroom suite with king bed. It hosts a patio door with exceptional lake views. A walk-in closet, private bath with double sinks, Jacuzzi tub and shower complete this private space. 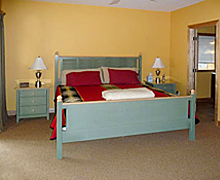 The main floor also features a second carpeted bedroom with queen bed and attached bathroom with porcelain-tiled floor and shower. This bath has second-door access from a hallway just off the kitchen providing access to others during the day and adding privacy at night. Down the hallway from the kitchen is a full laundry room to serve main floor living needs. 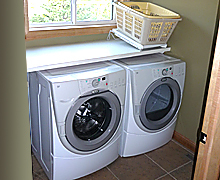 It holds an upscale large capacity under-counter washer and dryer, laundry tub and extensive cabinet and counter space. 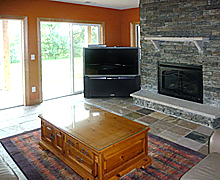 Follow the open staircase to the walkout level, where the heated slate floor provides the base for a huge family room complete with 52" TV/DVD/VCR and a stacked stone gas fireplace. A second full-size refrigerator sits next to the granite-topped buffet with wet bar, microwave, garbage compactor and under-counter ice maker. Double maple doors lead you to the guest suite featuring a king bed, its own lake-facing patio door, a walk-in closet and private bath with shower. On the opposite side of the family room, a hallway leads to two huge bedrooms, a two-room porcelain tiled bathroom complete with tub, shower and double sinks. 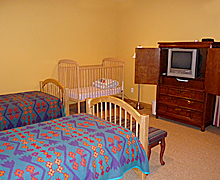 The fourth bedroom is carpeted and holds twin beds as well as a crib. 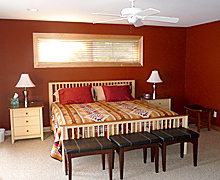 The fifth bedroom contains a king size bed and patio doors leading out to a three-season porch. The hallway also leads to a separate laundry room with washer and dryer, laundry tub and cupboards. The three-season porch has two patio door entries – one from the bedroom and one from the family room. Comfortable seating completes the outdoor feel while providing pleasant, mosquito-free evenings or shaded, day time relaxation. The porch also has a queen sofa sleeper for additional sleeping space if needed. 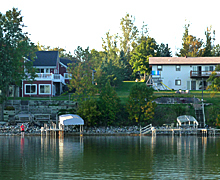 If a little quiet time is desired, enjoy the sunrise from the lakeside decks or observe the loons and gulls or fish swimming in the shadows of the dock. The level lake lot is ideal for outside activities. 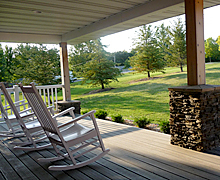 The street side of the house features an oversized porch which holds three comfortable rockers. Large patios and decks with plentiful outdoor furniture frame the lakeside of the house. A few steps are required to reach the lake level but they have been landscaped so there is never more than 4 steps at a time. 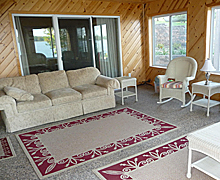 A beautifully landscaped lakeside deck is ideally situated to watch small children at play on the sandy beach. A gas grill is provided. Lake Louise — Pontoon with Motor & Paddleboat Included! Chateau Lake Louise sits on a calm approximately 300 acre lake with depths up to 33 feet that boasts Northerns, Crappies, Walleyes and Sunfish. 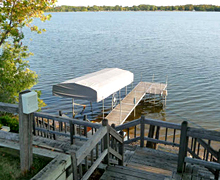 You can enjoy fishing from the docks or board the pontoon (included in rental fees) for a lake excursion. For additional on-site recreation, a paddleboat is available. Life vests are a must, so adult life vests are available, but to insure proper fit, please bring along life vests for your children. According to state law, all children under ten must wear a life vest at all times on the water. Adults must have one as well and, of course, wearing it is also recommended. An outdoor shower with hot and cold running soft water offers a quick, easy cleanup after a day on the lake. A picnic area, fire pit and Rainbow Play System are available for your enjoyment. The Haven next door Sleeps 11!